It is very natural for the users to get locked out of their Windows computer some times. The mishap is happening to a lot of users and they are really struggling with the issue at hand. There are actually, several password recovery procedures available but the problem is that some of them work for the older version of Windows and some of them works for the latest versions. But there is actually one program that is known to work on both. It is an old program but according to its website is really effective. The program is called Ophcrack Live CD. Ophcrack Windows 7 is effective and all the required details are clearly stated in this article. So, let’s have a look! 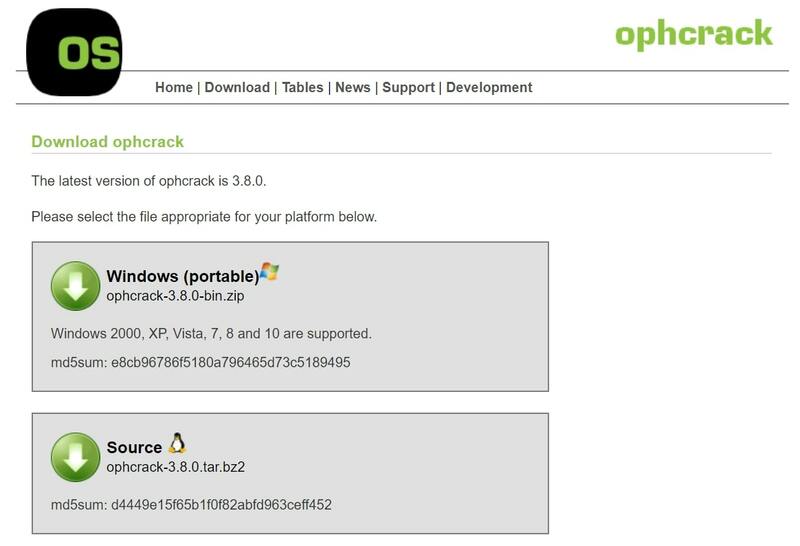 What is Ophcrack for Windows 7? Ophcrack Windows 7 is one of the oldest programs designed to crack Windows Operating Systems. This program is available for free and the implementation is very effective. The program is available on multiple platforms and it comes with a Graphic User interface. This it is very easy to use and anyone without prior knowledge can use it without much fuss. The program is available for free and completely open-source. Automatic password recovery Passwords using LiveCD method. There is no need for any software installation to recover passwords. This particular program runs on multiple platforms like Windows, Linux, Mac and OS X. The Live CD version of the program is only available for cracking Windows OS. It is unable to crack a password that is longer than 14 characters. Have some problems recovering Windows 10 passwords. Step 1: Find access to a different computer and then go to the Ophcrack download page from there. Step 2: Click on, “Download Ophcrack Live CD” on the page. The ISO file will start to download, but it will take a few minutes. Step 3: The downloaded file will not take too much space as the size is within 700 MB. Once the file is downloaded, burn Ophcrack ISO into a USB drive. Step 4: The burning process with taking several seconds, after that disconnect the USB drive. Step 5: Connect the USB drive to the locked computer and restart it. The Ophcrack Live CD will load into the computer and you need to select “Ophcrack Graphic Mode – Automatic”. Step 6: Now, the program will take over and reboot the device. It will reboot the computer first and then start the dictionary attack automatically, in order to recover the password. Step 7: It will take Ophcrack from a few minutes to a few hours to crack the code. After the procedure is complete successfully, reboot the computer and use the recover password to log in to the computer again. So, the program works really well and it is effective. But the time it takes to reset Windows 7 password is unprecedented and if the password is longer than 14 characters then you can forget about using Ophcrack, it won’t work. Well, as you can see Ophcrack Windows 7 or Ophcrack Windows 10 is an exceptional program for cracking Windows devices but it has several limitations. First of all, the program hasn’t been updated in years so it does not work with the new version of Windows well, sometimes it just fails to deliver. The newest updated Anti-viruses can detect it as a Trojan and it can’t crack passwords larger than 14 characters. So, you are better of using newer, faster and more effective password recovery programs. Step 1: Download the program on a different laptop or a desktop. Step 2: Then, run the program. Afterward, you will be asked to select a medium and your choices are USB and CD/DVD. Step 3: Choose USB as it will be convenient. 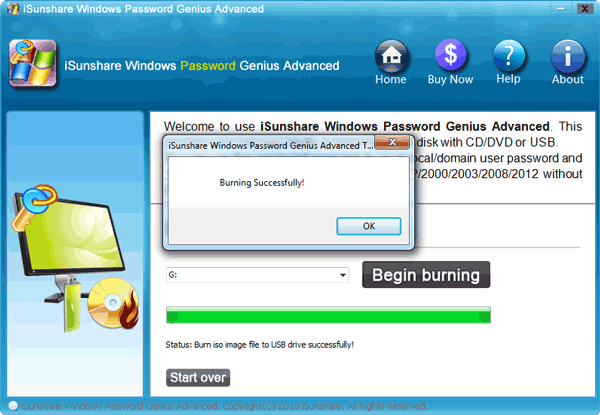 Step 4: Now, connect a blank USB drive to that computer and then click “Begin Burning”. 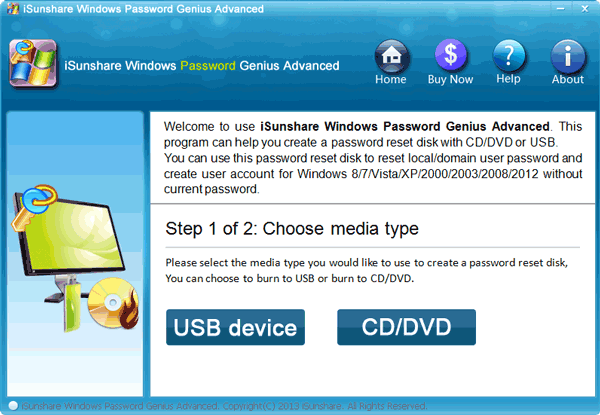 Step 5: The program will immediately start converting the USB drive into a password reset disk. The procedure will finish within a minute then, just click “OK”. Step 6: Now, insert that USB drive into your locked Gateway laptop then reboot it. Step 7: After the reboot access the Boot menu and select the USB and hit “Enter”. Now, the laptop will boot from the USB. Step 8: After the program is loaded on the laptop, select the Windows system and also select the locked account. Step 9: After that, click “Reset Password”. After the reset is successfully completed, click on the “Reboot’ button at the bottom of the password recovery tool panel to restart the laptop. After it restarts, the laptop will be unlocked. 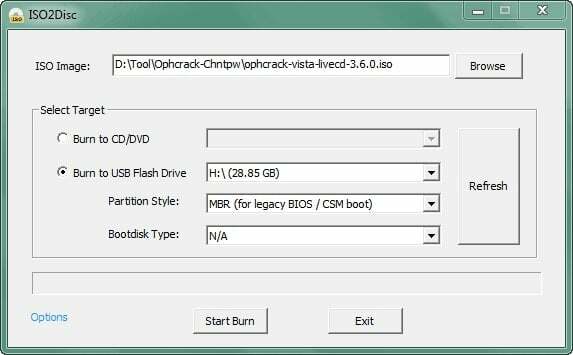 Overall, you can be sure that Ophcrack Live CD is one of the best recovery programs for Windows ever created but without proper updates and oversight it has failed to keep up with the advancements of the Windows OS. So, if you are using the newest version Windows OS, Ophcrack Windows 7 USB is not the way to get satisfactory results. 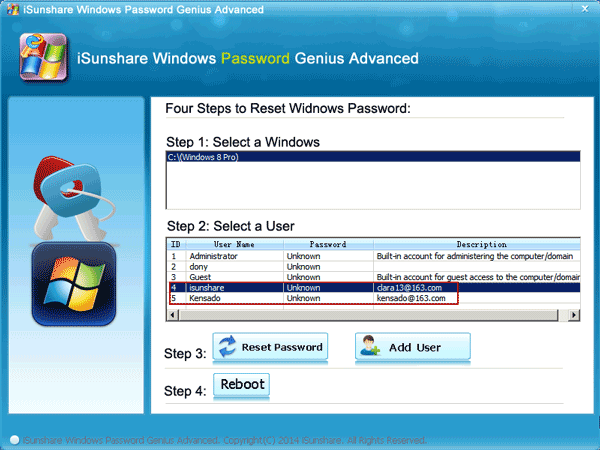 We highly recommend using Windows Password Recovery tool for all your Windows password recovering needs.